Ever heard of a cocoyam? If you’re from Nigeria you’ve definitely heard of it but it’s also more familiar to you than you may realize. The clue is in the name – it’s brown like cocoa and it’s a kind of yam. It’s like the Russet potato of the sub-tropics. However, unlike potatoes and yams, these tubers aren’t chock full of sugars which is excellent news for diabetics and people trying to steer clear of sugar. It’s actually chock full of all kinds of high value nutrients that the body needs. One of the reasons why it is so popular in certain parts of the world is because it is packed with protein, vitamins, and minerals. It helps stave off famine and is relatively easy to grow. But the fact is cocoyam is very regional; limited to parts of Africa and Asia. Most other parts of the world are completely oblivious to this super vegetable. So what makes cocoyam so special? For one, it’s very versatile. It can be used as part of your diet and the leaves are used for medicinal purposes. 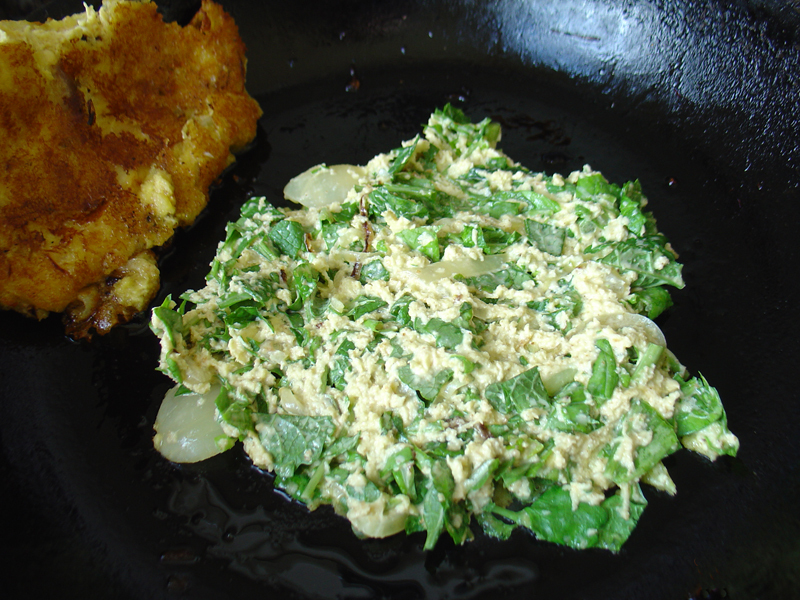 More than that, it is an excellent substitute for yams and potatoes for people with diabetes. And there are many other health benefits from eating cocoyam. We thought we’d share with you everything there is to know about the incredible edible cocoyam! This is the ultimate guide to cocoyam leaves. There are numerous health benefits of cocoyam but first things first – let’s get to the superficial stuff! Do you like healthy, full, shiny hair? Eat some cocoyam leaves. One of the best nutrients for your hair is vitamin E. Great news – cocoyam leaves have a lot of vitamin E in them which helps to keep your hair from falling out while also helping it grow by improving your blood flow. We like pretty skin too don’t we? Well, in addition to vitamin E, cocoyam leaves contain high levels of vitamin A which in combo is super for your skin. It helps keep your skin moisturized and protected from the sun. In fact, if you use cocoyam leaves or a paste on your skin, over time, it helps get rid of blemishes and smoothes out your skin. Digging a little deeper, there is another nutrient that cocoyam is richly blessed with and that is vitamin C. There is so much vitamin C in cocoyam leaves that just one cup of them a day gives you almost all of your daily value of vitamin C necessary for good health – we’re talking 90%! That’s great news for people with vitamin C deficiencies or who are prone to colds and viruses. Vitamin C helps toughen up your immune system. Let’s go real deep to the big ticket health benefits of cocoyam leaves. The biggest is its ability to lower blood glucose levels and to stabilize them. Up until recently, there was not a lot of research about cocoyam since it is mostly a staple of what used to be called “undeveloped” countries. Now scientists in the region have put work into researching this super food and have found amazing potential for naturally helping to control and manage diabetes. Do you suffer from digestive issues like IBS (irritable bowel syndrome)? If so, listen up! There is now evidence that a daily dose of cocoyam can actually help regulate your digestive system. Like any other tuber, cocoyam is rich in dietary fiber which helps you process and digest food. It is in the roots and the leaves that you get all of these wonderful nutrients from cocoyam. Eating cocoyam leaves is the ideal way to squeeze all of the good stuff out of them and into your body. Vitamins aren’t the only health benefits contained in cocoyam. It is also fiber rich and starchy. That means that while you get no sugar from this tuber, you are getting carbohydrates so if you are dieting and trying to stay away from carbs, remember, cocoyam is packed with it. You know what else the roots are packed with? Protein. Some of the best research out there to date reveals that, because of its qualities for improving digestive health, people with ulcers, IBD, pancreatic, gall bladder, or liver disease can handle the starch in cocoyam where other starchy foods cause problems. It’s even gluten free (which is a thing now) for those who are allergic to gluten. But the trick is to choose cocoyam leaves that are smooth and unblemished. Some of the countries where you are most likely to find commercial cocoyam growers include Nigeria of course, but also the Pacific Islands, Ghana, Japan, and other parts of Asia. You can eat cocoyam leaves raw or you can cook them. There are a number of ways to do that – in fact many more ways than its North American cousin the yam. One of its more popular preparations is as a soup thickener. You chop and boil some cocoyam corms, blend them, and then add them to soups to make them heartier. It’s also used for weaning and made like porridge for babies and children. You can also cook cocoyam corms like you would a yam by roasting it, baking it, or frying it. You can also grind it into a mill as a soup stock thickener. The leaves can be added whole to soups, served as a garnish, or prepared as a green side dish. Want to try your hand at cooking cocoyam? We found a few recipes for you for the most popular cocoyam meals. The first is the all important cocoyam porridge. If you have a child or baby that is weaning or has digestive issues, maybe even diabetes, this could give you a healthy option that also helps them feel better. First you’ll need to peel and cube one cocoyam tuber. Then you’ll want to chop and blend a mix of peppers. You’ll also need one small onion finely chopped, a chopped clove of garlic, and a tablespoon of palm oil. A couple of ingredients you may need to go to a specialty store to buy (try an Asian grocery and look for “Taro” if you can’t find cocoyam – it’s the same thing). 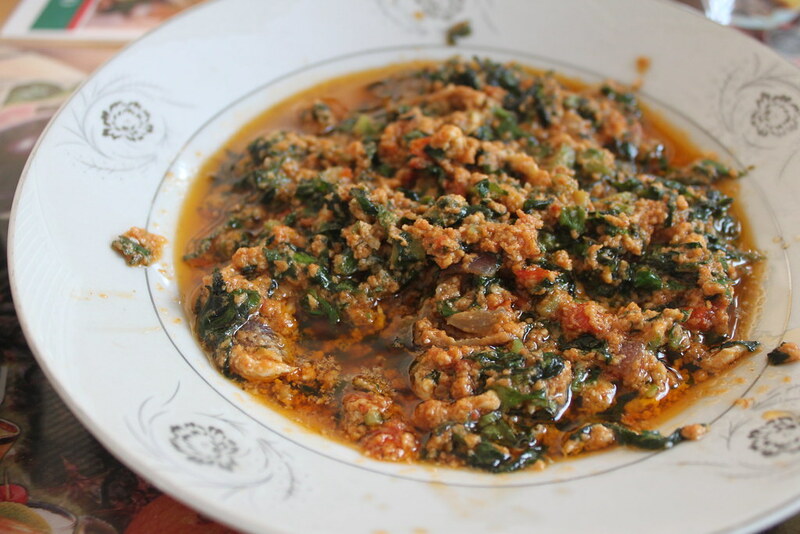 For instance, this recipe calls for a tablespoon of “blended crayfish” and a cube of “maggi.” You’ll garnish it with “ugu” or you can substitute that with spinach. Grab a big old pot and add the oil. Once the oil is heated up (let’s say over medium-high heat), stir in the onion and garlic until the onion is cooked. Next mix in the pepper mix, maggi, crayfish blend, one and a half cups of water, then salt to taste. Cover and let the mix cook for about five minutes before adding the cubed cocoyam (you’ll need 4 cups total). Now simmer for about a half an hour. You may have to add more salt and you could add some other chopped vegetables of your choice if you want to make it even heartier! This porridge is usually served with a protein. Two of the most popular soups in Nigeria that are cocoyam based are Bitterleaf Soup and Ora/Oha Soup. You can find recipes for these fantastic soups here along with tons of other Nigerian meal recipes. Cocoyam and Diabetes - Is Cocoyam Good for Diabetes Patients? As we’ve said before, diabetics are some of the biggest beneficiaries of new research that has discovered the health benefits of cocoyam for diabetes patients. For diabetics, controlling sugar intake and how it affects your blood is an ongoing battle. Your diet has a lot to do with how well controlled the disease is. The more sugar and fat in your blood, the worse your diabetes will get. Controlling your glucose (blood sugar) levels can help keep your diabetes from getting worse and causing nerve damage that results in amputations. Since diabetics cannot process sugar well (either producing too little or the insulin doesn’t absorb into the cells when blood sugar levels rise) most try to eliminate sugar from their diets altogether – not an easy thing to do, especially in the U.S. In America, we put sugar in everything; even packaged bacon has sugar in it! So finding other ways to replace the foods that we love with those that have no sugar-spiking effects can be very difficult. There is new evidence that foods like cocoyam can help do that for diabetes patients. In addition to being helpful for controlling diabetes, it turns out that cocoyam leaves are good for pregnancy. When you think of all of the nutrients contained in these leaves, it makes sense that consuming them could help the fetus and the mother’s overall health. All of those vitamins that we talked about earlier that help skin and hair also help improve brain function and nervous system development in fetuses. Pregnant women lose lots of nutrients to the fetus inside of them. Eating cocoyam can help replenish those vitamins and minerals, serving as a health benefit for both mother and child. Additionally, one of the most painful and dangerous ailments that pregnant women suffer from is preeclampsia. There is some research that shows that another health benefit of eating cocoyam leaves is helping to prevent preeclampsia in pregnant women. Outside of Africa cocoyam is typically called Taro. It belongs to the plant genus Arum in the Araceae family. It actually has two botanical names for the two different types of cocoyam. The Colocasia Esculenta is the botanical name for Taro or “old cocoyam.” New cocoyam’s (also called Malanga) botanical name is Xanthosoma Spp. You can tell the difference between the types of cocoyam by the way that the leaves are attached to the stalk (either the leaves are attached to the stalk or shoot out near the center of the plant). 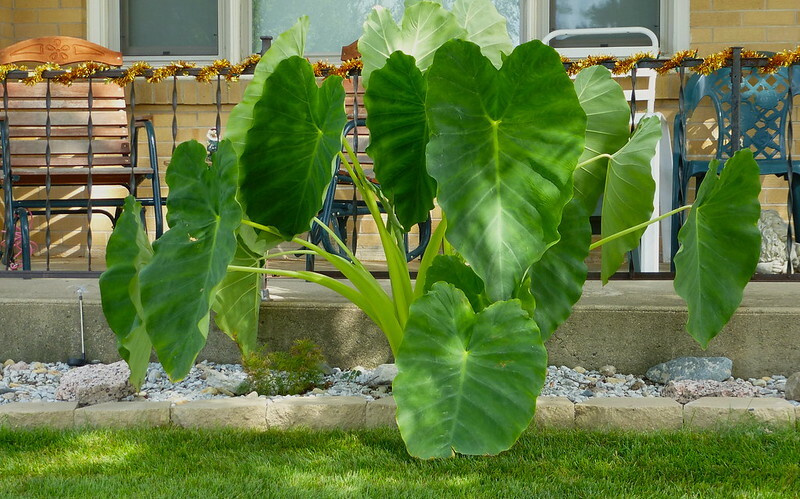 The plant itself is huge and the leaves are sometimes called “elephant ears.” The leaves can grow up to a half a meter in the shape of a heart. The stem itself stands one meter above the ground. It can be cultivated on a small scale individually as is often the case in many small African villages but it is also commercially processed and produced. Depending on where in the world it is being produced, it is called by different names and used for different purposes. For example, in the Caribbean, cocoyam is called dasheen and is usually used to feed livestock. Cubans call it by its new name, malanga. Like in Africa, cocoyam is a food staple in the Pacific Islands where it was originally domesticated. Being a largely tropical and sub-tropic plant, you need higher temperatures year-round to grow cocoyam. It takes a whole year to grow to maturity in a climate range between 77 degrees and 95 degrees. To begin planting and cultivating cocoyam, you need the corm or root. You chop up the corm to be planted. The soil has to be prepared before planting. The ground should be moist and not rocky. You must fertilize the soil with either compost or manure and bed each stock piece between one and a half and two feet apart – remember these are pretty big plants once they are full grown and need a lot of space. Climate change is having such an effect on cocoyam production that there are new “drought resistant” plants that can grow during long dry periods. There are other factors too that challenge cocoyam production. According to one study, some of the main challenges to production besides climate change include a lack of farming experience, limited access to financing, lack of land, fertilizer, and materials for planting all leading to a higher mortality rate for cocoyam. Also challenging the production of cocoyam are two root rot diseases that specifically affect this staple: CRRD (Cocoyam Root Rot Disease) and TLB (Taro Leaf Blight). Despite these headwinds, the amount of cocoyam being produced has grown exponentially since the 90s and is growing and spreading out to Central America and other parts of the globe. As a result, cocoyam is as readily available year-round as potatoes and yams. As a staple in some of the most populous areas in the world in Asia and Africa, the economic importance of cocoyam to those regions cannot be overstated. For one, it is one of the least expensive crops to produce for poor farmers with limited resources. That is crucial because in times of famine, war, and drought, cocoyam is able to stave off starvation when there is limited access to food. 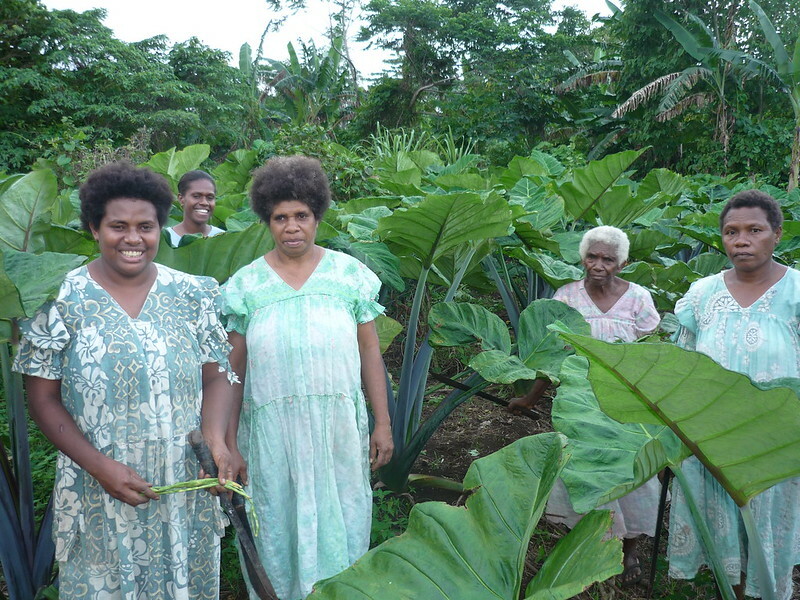 African women by and large make up the majority of cocoyam farmers. In fact, in some parts it is called a “woman’s crop” and associated with low income people. 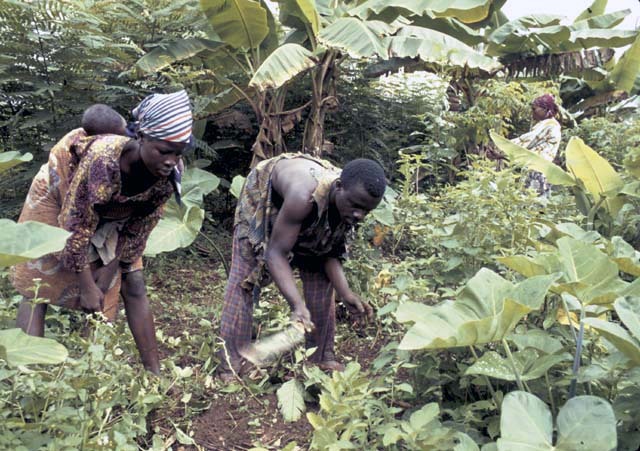 A woman managing a small individual cocoyam farm to sustain her family or to sell is tradition. Without those crops, the level of food insecurity affecting many parts of Central and Western Africa would be beyond devastating to entire regions.